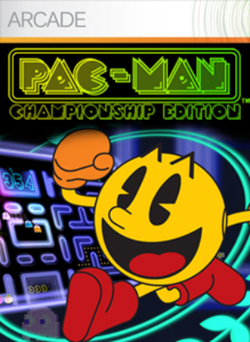 Pac-Man Championship Edition (パックマン チャンピオンシップエディション, Pac-Man Championship Edition? ), sometimes simply referred to as Pac-Man C.E., is the latest Pac-Man game, developed by original Pac-Man creator Tōru Iwatani, exclusively for the Xbox Live Arcade. The game was released on June 6, 2007 for 800 Microsoft Points ($10 USD). The announcement of the game actually spurred more purchases of the Xbox 360 in Japan, and it was Iwatani's final game before retirement. Pac-Man C.E is also available on a disc titled Xbox Live Arcade Compilation that is bundled with the Xbox 360 Arcade console bundle, as well as on the compilation package Namco Museum Virtual Arcade. Like the original Pac-Man, the basic gameplay of Pac-Man C.E. consists entirely of navigating Pac-Man through a maze, eating dots, power pellets and bonus fruit, and avoiding the four ghosts that roam the maze as well. Eating a power pellet causes the ghosts to turn blue, allowing Pac-Man to eat them and send them back to their home, where they re-emerge in their original form. If Pac-Man is caught by a ghost, the player loses a life. As of recently Pac-Man C.E revealed a new fruit set up and there are 22 items. This page was last edited on 4 March 2016, at 09:29.